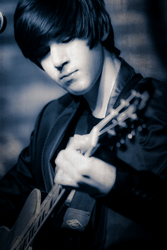 Chris Monaghan is a young, up and coming singer-songwriter from Harford County, Md. He recently completed recording and released his first album, and signed an artist development deal with Nashville-based producer, Kim Copeland. Chris is one of those rare artists who possess both amazing raw talent and a deep passion for music. Since picking up a guitar at age 9, 15-year-old Harford County, Md. native, Chris Monaghan’s music career has flourished to remarkable heights. Over the past year, Monaghan has recorded and released his first album titled “Shameless” and signed an exciting artist development deal with top Nashville-based producer, Kim Copeland. The deal is a milestone in advancing Monaghan’s musical career as he works to broaden his fan base and establish himself as an artist. Copeland, based in Nashville, Tenn., is renowned in the music industry, having worked with artists such as Rachel Williams, Drake Jensen and Susan Rose. Monaghan was recently featured in her “New Artist Showcase” where he performed in front of a sold-out crowd at one of Nashville’s premier venues, The Listening Room Cafe. With well over 100 shows under his belt, Monaghan’s impressive resume of performances includes the Little League World Series at Cal Ripken Stadium, Susan G. Komen Race for the Cure and Nashville’s iconic Bluebird Cafe where country superstars such as Garth Brooks and Taylor Swift were discovered. Monaghan’s music has an acoustic pop-rock feel and has been compared to the likes of singer-songwriters, John Mayer and Dave Matthews. Among his numerous upcoming performances, Monaghan will lend his musical talents to the Susan G. Komen Race for the Cure for a second time, singing in front of 30,000 people as they walk or run to support breast cancer awareness on Oct. 20, in Hunt Valley, Md. He will return to Nashville’s Blue Bird Cafe for a sold-out Saturday night performance on Oct. 26. This inspirational message is prevalent not only in his musical works, but also in his community and charitable work. Monaghan wants to use his music for community outreach. He hopes to partner with a charitable organization in the near future to help raise funds and awareness for one of the many causes he cares about. By performing at an organization event and donating 100 percent of proceeds from albums sold to the charity’s cause, he wishes to spread the encouraging message “Shameless” describes. Organizations interested in partnering with Chris Monaghan to raise funds and elevate awareness for their cause can contact his management by email. They are considering various options at the moment and are open to new ones. Visit Monaghan’s website http://www.chrismonaghanmusic.com to listen to song samples or purchase his new album, “Shameless.” The album is also available for purchase on iTunes, CD Baby or through his website. For additional information, contact Josie Hankey at the Fallston Group at 410-420-2001 or by email.